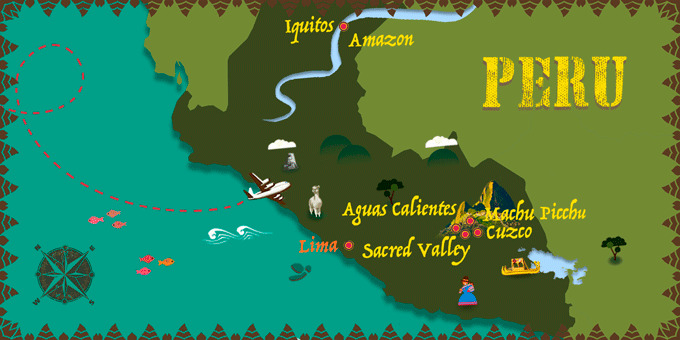 Experience the vibrant culture of Peru and it's ancient Inca Empire. Explore Lima, the gastronomy capital, and sample the iconic ceviche. Uncover the mysteries of the Sacred Valley and the Inca capital of Cuzco before exploring Machu Picchu, a true wonder of the past. Head to Iquitos and stay in a riverside lodge in the Amazon to discover the abundant wildlife of the tropical rainforest. International flights: US - Lima & Cuzco - US. 7 Breakfasts & Full board in Amak Lodge. Sacred Valley: San agustin Urubamba, Autustos Urubamba. Aguas Calientes: Hatun Samay, Flower's House. If you are interested in travelling on a date not included on our departures calendar, please contact our Customer Service Department. Arrive at your US departure airport ready to check in for a flight to Lima. Night on board. Breakfast at the hotel. Today, renjoy an informative and interesting city tour of Lima, including its Historic Centre and the Santo Domingo Convent. Start by exploring the districts of Miraflores and San Isidro before heading to the Historic Center. Visit the impressive Convent of Santo Domingo and walk to the Plaza de Armas to admire the exquisite colonial architecture that surrounds it. Next, enjoy a visit to the Chocolate Museum to learn about the high-quality of Peruvian cocoa, and on the way back, stop in the Parque del Amor, from where you can take beautiful photos of the Peruvian coastline. Overnight stay in Lima. Breakfast at the hotel. At the indicated time, transfer to the airport for a flight to Cuzco. Arrive in Cuzco, the former Inca capital, and transfer to the Sacred Valley. Spend the remainder of the day at your leisure, exploring the lively immaculate scenery of this iconic region. Overnight stay in Sacred Valley. * Optional Essense of the Sacred Valley Excursion: Visit Chinchero and the PARWA Centre, to appreciate the colourful traditional textiles. Next, visit the church of Chinchero before heading to the Mirador de Racchi panoramic viewpoint for a fantastic view across the valley. Explore Ollantaytambo and its Inca fortress and visit the impressive Moray archaeological site. Price per person: $53. Breakfast at the hotel. An exciting day at Macchu Picchu awaits you this morning as you set off for the train station to board the Voyager Train to Aguas Calientes,* admiring the landscape along the way. Arrive and transfer to the UNESCO World Heritage Site of Machu Picchu, a true wonder of the world. Spend some time discovering the ruins and being amazed by the terraces and enjoying a tour of the different sections of the site. Return to Aguas Calientes and check-in to your hotel. Overnight stay in Aguas Calientes. * Optional Full Day Excursion to the Rainbow Mountain of Palccoyo: Leave Cuzco at dawn, heading towards the town of Palccoyo, a journey of approx. 3 hours. From here, ascend on foot through beautiful landscapes until reaching the impressive Rainbow Mountain. Partake in a traditional Andean ceremony and be amazed by the colorful mountainous surroundings. The maximum altitude is 4980 m and the hike can take up to 4 hours. Minimum 2 people. Does not operate January - March. Price per person: $111. Note: The optional excursion to Palccoyo operates from April to December on Tuesdays, Thursdays and Sundays. Outside of these dates you will visit the Mountain of Seven Colors in Vinicuna instead. And it does not operate between January and March. * Optional Half-Day Cuzco City Tour: Begin your tour in the Plaza de Armas, and visit the Cathedral. From here, walk to the Koricancha Temple, an impressive ancient Inca palace, in honour of the Sun God. Today, a Dominican church stands on the site. Finally, visit the lively San Blas neighbourhood, known for its artists, shops and artisan workshops. Price per person: $34. Breakfast at the hotel. At the indicated time, transfer to the airport for a flight to Iquitos, a port city and gateway to the Northern Amazon. After meeting your guide and receiving some advice on exploring the jungle, transfer to the port to enjoy a boat trip on the Amazon River, headed for your lodge in the heart of the Amazon. Look out for local wildlife along the way before arriving at the lodge in time for lunch. In the afternoon, set off on a jungle hike into the Yanamono rainforest reserve with an expert guide to introduce you to the many flora species and point out the different bird and wildlife along the way. If you are lucky you might spot small families of monkeys, such as marmosets or even Squirrel monkeys. Return to the lodge for a magical sunset boat trip on the Amazon river. Dinner and overnight stay in the Amazon. Rise early for an early morning bird-watching excursion by boat, and spot a number of unique species such as the Ringed Kingfisher and the Black-Collared Hawk. Return to the lodge for breakfast and a short rest. Later, head out on a Native Fishing Expedition, along one of the tributaries of the Amazon River. Learn local fishing techniques and even try and catch an elusive Piranha. Keep an eye out for the weird and wonderful Pink River Dolphins, unique to the Amazon. Return to the lodge for lunch, where anything you caught can be cooked for you. In the afternoon, board a boat for an excursion to Yanamono Island, the best place to see the beautiful Giant Water Lillies, which can grow to an amazing 40cm in diameter. As night falls, enjoy a night-time nature hike around the periphery of the lodge to witness the transformation of day to night in the Amazon. This is the best time of day to spot tree frogs, snakes and other nocturnal animals, such as night owls. Return to the lodge for dinner and overnight stay in the Amazon. Breakfast at the lodge. Today, visit a local riverside town to meet an indigenous tribe of the Yaguas community. Learn about their way of life on the Amazon River and see their community buildings. The locals will share their fishing and farming techniques with you as you enjoy a fascinating insight into life on the Amazon. Return to the lodge for lunch and enjoy the rest of the day at your leisure. Dinner and overnight stay in the Amazon. Breakfast at the lodge. This morning, take a short boat ride on the Amazon River to visit a traditional family-run Sugar Cane Distillery. Learn the local techniques for processes sugar cane and enjoy a tasting session of the varied exotic beverages made from the sugar cane liquor. Return to the lodge for lunch and at the indicated time, transfer to the airport for a flight back to the US. Night on board. 7 Breakfasts & Full board in Heliconia Amazon River Lodge. Lima: Jose Antonio Executive, Nm Lima, La Hacienda Lima, San agustin Exclusive. Cusco: Xima Cusco, Los Portales, San agustin Dorado, San agustin Plaza. Sacred Valley: La Casona de Yucay. Aguas Calientes: Casa Andina Standard Machu Picchu, Inti Punku.